You may have heard the term "real rate of return". It is how much buying power your investment gives you after your consider the 'cost' of inflation. Investors Group January newsletter warns of the risks of low-yield fixed income investments once you consider the real return. Their chart shows the real return of a short term investment like a 1-year GIC (i.e., the grey bar labelled 'after inflation' below). It assumes it is in taxable account (non-registered). Sadly, you are losing buying power after inflation! Investors Group is underestimating the 1 year return you could get if you shop around. Achieva Financial even offers a 2% savings account rate, but your a still earning less than inflation after taxes, so if you must be in short term fixed income holdings, at least don't leave 1% on the table. 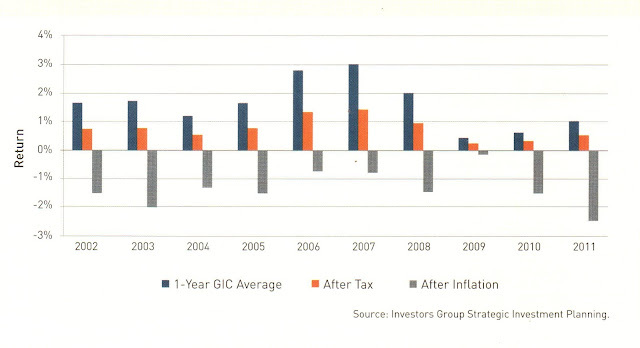 Investors Group's conclusion is that you should consider equities or bonds. What makes more sense is to stick with high yielding fixed income investments. Avoid the big banks for GICs, and stay away from bond and money market funds where management expenses will put you further in the hole and could put you at risk of losing principal when today's record-low interest rates increase. Achieva's 5-year GIC rate of 2.85% or ICICI's promotional rate of 3.15% will put you further ahead than Investors Group's money market or bond funds (0.28% and 1.84%, respectively, for Investors Canadian Money Market and Investors Canadian Bond considering the past year - meaning after inflation you lost buying power). At least non-bank GICs will cover inflation, or some of the other investment ideas noted in previous posts. Private REITs are a great way to earn a great yield and to potentially benefit from capital appreciation - something that GIC will never do for you!